Sometimes I make myself a real adult dinner and this is what it looks like. I even applaud myself as I sip my wine in self-satisfaction. Some of my other delicious "adult" dinners have been my 30 Minute Vegan Jambalaya which is a spice lover's paradise. Or if you love soups, my Cauliflower Turnip Cheddar Corn Soup is perfect for a cold winter's night. 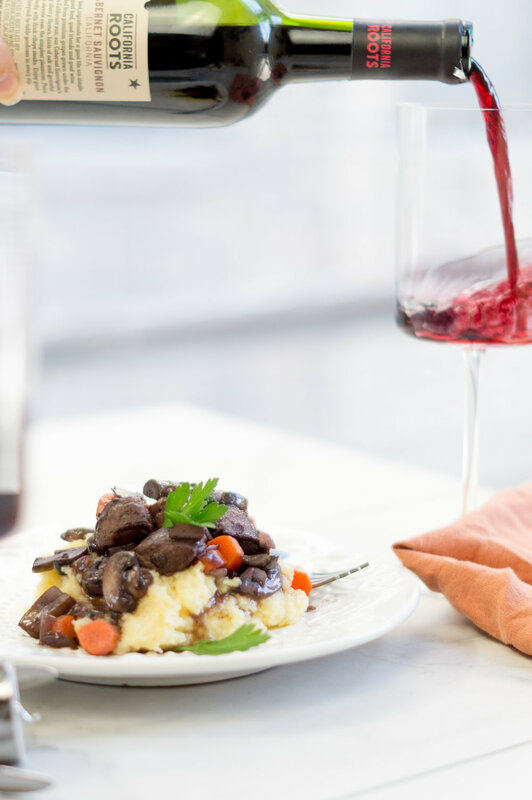 In all seriousness, though, this recipe reminds me of something my parents would have made for dinner when I was younger (minus the glass of wine, of course). We would use polenta as a base for pretty much any stew-type meal. Polenta is always quick cooking making it an easy carb to add to your plate for a well-balanced meal. If you don't know what polenta is, the easiest comparison is grits. But, I promise, this is a much fancier - and in my opinion, tastier - version of grits. This recipe has everything that the standard dinner plate would show: meat (fake meat in this case), vegetables, and a carb. The beefless tips are from Gardein and they're pretty much the closest thing to beef tips a vegan will eat. They're also loaded with 20g of protein a serving which is a huge bonus. I love to cook with wine, particularly red. It creates a flavor that I can't mimic with other ingredients. It's a little acidic-y but simulates a richness in flavor that's completely unique to itself. If you're looking for a hearty, winter meal, this stew is sure to fulfill those cravings. I save this recipe for extra cold nights, especially those that involve snow. The leftovers keep very well, but I recommend keeping the polenta and stew itself in separate containers so the polenta doesn't become soggy. Slice your mushrooms, slice your carrots, and mince the shallot and garlic. Prepare your slurry, combining the tbsp of cold water and tbsp of arrowroot flour in a small dipping bowl. Over medium high heat, add a splash of water to a large sauce pan and add the shallot. Once it starts to brown, add the mushrooms and carrots. When the mushrooms start to shrink in size and their water is released into the pan, add the garlic, beefless tips, and wine, stirring to coat each mushroom. Add a pinch of salt and pepper. Stir in the slurry to thicken the juices. Cover and turn off the heat heat. In a medium sized pot, add the 4 cups of water and 2 cups of dry polenta, turning the heat on high, constantly stirring. You will know the polenta is done when it thickens and the excess water has completely evaporated. Once this happens, add the nondairy milk, vegan butter, and vegan parmesan. Stir together to evenly combine. 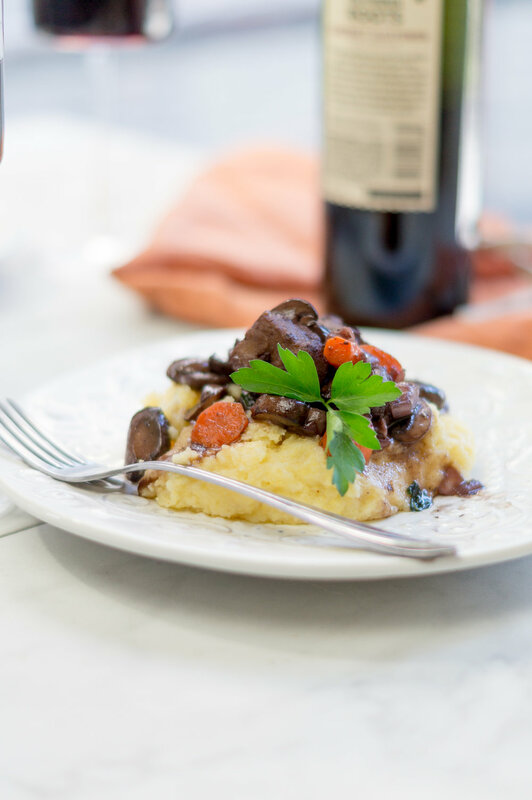 Scoop a helping of polenta on to a flat bowl or plate, then add a serving of the mushroom and beefless tips mixture. Garnish with parsley and enjoy!